Dear Readers: It will be a while before I am able to post again. I thank you so much for reading and do look forward to writing again, but have some things to do and cannot blog. All the best, thanks for stopping by. This entry was posted in Uncategorized on August 10, 2013 by jimpurcell66. Who’s running for alderman in Franklin? FRANKLIN (MACON COUNTY, NC) — Four candidates have thrown their hats into the ring for the November election this year: Tom Ritter, Adam Kimsey, Billy Mashburn and Barbara McRae. Ritter is a Wisconsin native who is an architect. He graduated with his bachelor’s and Master’s degrees from the University of Wisconsin. He relocated to Franklin in 2001 and operates Ritter Architecture. Kimsey has human resources experience and has worked at Caterpillar. Mashburn is a Franklin native graduated from Southwestern Community College. He is retired. McRae came to Franklin in 1983 and received her bachelor’s degree in biology from St. Louis University in 1964 and worked for IBM. This entry was posted in Franklin, Macon County, Politics and tagged Adam Kimsey, Alderman, Barbara McRae, Billy Mashburn, Tom Ritter on July 30, 2013 by jimpurcell66. Who’s running for mayor this year in Franklin? FRANKLIN (MACON COUNTY, NC) — Running this year in the Tues., Nov. 5 election for mayor of Franklin are Sissy Pattillo and Bob Scott. Pattillo former served on the Franklin Board of Alderman, for a seven-year period. Pattillo filed to run on July 5. She is a Franklin High School graduate and attended the University of Greensboro and Western Carolina University. Scott currently serves on the board. He has served for a decade in office. He moved to Franklin during the late 1960s and attended the Western Carolina University, where he earned a bachelor’s degree in criminal justice. This entry was posted in Franklin, Macon County, Politics and tagged Bob Scott, Mayor, Sissy Pattillo, Tom Ritter on July 28, 2013 by jimpurcell66. 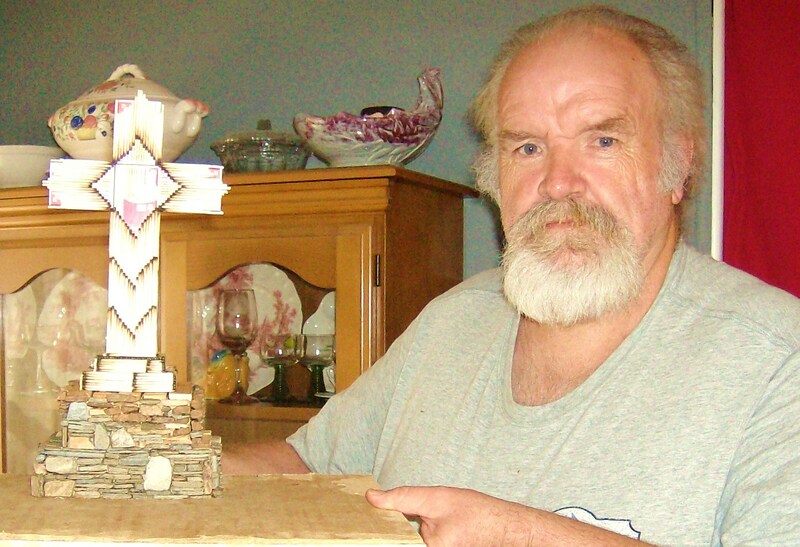 David Martin lives in East Franklin and has been doing matchstick art for 20 years. David Martin lives in East Franklin has been creating art from matchsticks and matchboxes for 20 years. During that time, the Franklin resident has created hundreds, if not thousands, of crosses out of these, reflecting his strong Christian beliefs. When not working on his craft, Mr. Martin is a local mason who works in construction. This entry was posted in Culture, Franklin, recreation and tagged artist, crafter, David Martin, matchboxes, matchstick art on July 25, 2013 by jimpurcell66. I am a Northerner, a Yankee, a city boy…however you want to say it. Being from New Jersey, and being born in arguably the ugliest city in the country, Newark, and educated in Manhattan, New York, the perils of urban life never really struck me as strange: crime, over-population, corrupt officials, the drug culture, the booze culture, the cultural anything or the diversity. I have yet to encounter anything in a major city in this country that strikes me as odd or even unique, and I have spent time in most of the big cities in the USA. With that said, I want to talk about one thing, in particular, that has always, always bothered me about the state of Florida — alligators. I was reading the Asheville Citizen-Times today and there was one story that caught my eye: “Jacksonville police kill gator after it ate dog.” Well, before I was done reading the headline I was glad I was living in the Smoky Mountains of North Carolina now, because I dare you to find an alligator about 500-feet elevation in North Carolina. Like many New Jerseyans, I was briefly a Florida resident. It seems so many people from the Garden State, at one time or another, go to FLorida to see if it is for them. Well, I tried it out in Tampa, and even moved right next to the medical center they have there, which is down the street from the former Legends Field, now Steinbrenner Field, the Yankees’ Florida facility and in direct eyesight of the Buccaneers’ football stadium. So I was in what I thought was a good spot. But, behind my apartment there was a small creek and two signs, which I took as cute jokes for the kids in the development: “Please fon’t feed the gators” and “This is a non-picnic area, beware gators.” Some apartment living levity, I thought. Ask the dog in Jacksonville that just got eaten how much time he would have had to call the police, if, of course he had opposable thumbs or could talk. But, the answer is not long. I know there are weight issues of the world in the news, from economics to wars in Southwestern Asia to the crushing immigration problem confronting our nation. But, I just want to say I am grateful to be living someplace where the only sign of alligators are on boots, hat accessories and belts. In the United States, our government is famous for waging wars against big problems that are hard to solve: The War on Drugs, the War on Illiteracy, and the War on Cancer. Here’s an idea for a war on something we can actually solve: The War on Gators. In my book, alligators now and for evermore either belong in remote, unpopulated areas, in zoos or existing in the form of apparel somewhere. I suppose this is my first attempt at a comedic ‘rant’ here and I hope it made someone smile along the way. This entry was posted in Culture, Vacation and tagged alligators, Florida, Jacksonville, North Carolina, Smoky Mountains, Tampa on July 25, 2013 by jimpurcell66. The Macon County Fair Grounds will host the 26th Annual Missions Bazaar, in Franklin. The event will take place on July 26-27 (Fri., 8 a.m. to 3 p.m.; Sat., 8 a.m. to 1 p.m.). The bazaar is being sponsored by the Franklin First United Methodist Church and all proceeds to to support missions of the church. For more information, call (828) 524-3010. This entry was posted in Economic, Franklin, recreation and tagged 2013, 26th Annual Missions Bazaar, Macon County Fairgrounds on July 24, 2013 by jimpurcell66. This video is a few months old, but for ratepayers in the Macon County area this is especially important news. This video was shot May 21 at the Macon County Courthouse, in Franklin, at 7 p.m. This entry was posted in Economic, Franklin, Macon County, media and tagged Duke Energy, hearing, May 2013, rate hike on July 24, 2013 by jimpurcell66.